India's much-vaunted batting was dismissed for its seventh-lowest ODI total -- 92 in 30.5 overs in the fourth ODI as New Zealand tasted success in the five-ODI series for the first time after already conceding the rubber. Outplayed in the fourth one-day international, Indian pace spearhead Bhuvneshwar Kumar on Thursday said the eight-wicket loss to New Zealand is a “reality check” for the team ahead of the remainder of the series. India’s much-vaunted batting was dismissed for its seventh-lowest ODI total — 92 in 30.5 overs in the fourth ODI as New Zealand tasted success in the five-ODI series for the first time after already conceding the rubber. “If you look at the cricket we have been playing in the last few months, we have played good cricket and such matches come after some time. So it is a kind of reality check what we can do and improve in the next matches,” Bhuvneshwar said. “We were confident after winning the series but things didn’t go our way. I don’t want to take credit away from these guys (New Zealand bowlers). 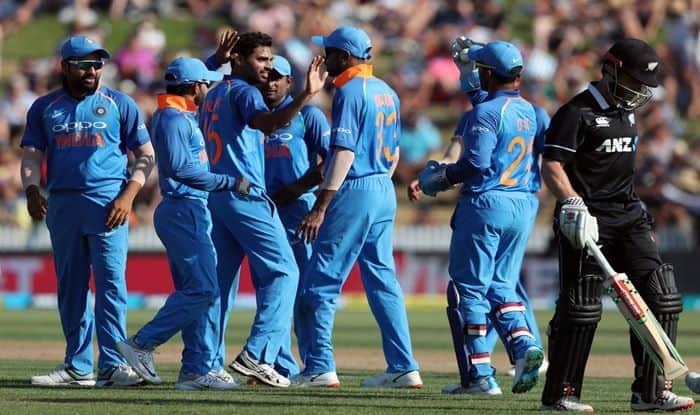 They bowled really well and outplayed us.” After the fifth and final ODI at Wellington on Sunday, India will play three T20 Internationals against New Zealand starting February 6. Seamers Trent Boult (5/21) and Colin de Grandhomme (3/26) exploited the swinging conditions to perfection to make life difficult for the Indian batsmen. Asked if New Zealand exposed India’s weakness on Thursday, Bhuvneshwar said: “Not really, we have played in England, South Africa and Australia, and we have done really well. “I would say they bowled really well, bowled some amazing and unplayable balls and yes overall, they outplayed us.” With talismanic skipper Virat Kohli rested after the side claimed an unbeatable 3-0 lead and former captain Mahendra Singh Dhoni recovering from a hamstring strain, India handed young Shubman Gill his debut and brought in left-arm pacer Khaleel Ahmed in the playing XI in place of Mohammed Shami. Bhuvneshwar admitted India missed Kohli in the game. “See you always miss him (Kohli) in such kind of wickets but at the same time it was an opportunity for Shubman Gill who came in his place. What he (Kohli) has done is amazing but we always don’t want to depend on him,” he said. Asked if it was a case of lost opportunity for some of the middle-order batsmen, Bhuvneshwar said: “We can’t say that from just one match. It was a tough wicket to bat. It wasn’t a lost opportunity but it is a learning for all of us.” Bhuvneshwar said he was surprised at the way the wicket behaved at the Seddon Park. “I was a bit surprised, if you look at the wicket, it shouldn’t play the way it played,” he said. “But yes, but that’s how this game is, it is unpredictable. The way Trent Boult and Colin de Grandhomme bowled was quite beautiful.” Asked if it was a good lesson ahead of the three-match T20I series, Bhuvneshwar answered in the affirmative. “Yes, of course but the format will be different and I am sure we won’t get this kind of wicket but in the one-day matches back home we can take a few things from here,” he said. Bhuvneshwar didn’t get a game in the historic four-match Test series against Australia but made a comeback in the playing XI in the ODI series. “Ya, it (rhythm) is back but more important is that I am getting wickets. It helps your confidence which you can carry in the next few matches. So yes rhythm is back and pace is up there where I wanted,” he signed off.